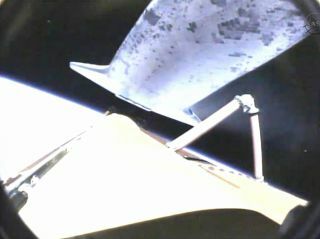 Endeavour's onboard camera shows the external fuel tank falling away following launch on May 16, 2011. This story was updated at 9:26 a.m. EDT. The astronauts aboard the space shuttle Endeavour performed an intensive scan of their orbiter's sensitive heat shield tiles today to make sure they didn't incur any damage during liftoff. "Once we got onto orbit, the crew had about five hours of timeline, mostly converting the vehicle from a launch vehicle to orbiting spacecraft and to get the robotic arm checked out in preparation for today's survey," space shuttle lead flight director Gary Horlachersaid in a briefing today (May 17). Today's heat shield inspection began around 3:41 a.m. EDT (0741 GMT) and took the shuttle's six-man crew more than five hours to complete. "I want to thank Gabby, Claudia and Claire for that great wakeup song," Kelly said. "It's always good to hear. Here's to a beautiful day in space!" Space shuttle Endeavour appears to fly past flags in the foreground, on its way to the International Space Station. Launch of the STS-134 mission took place at 8:56 a.m. EDT on May 16. Kelly and his crew awoke at 11:56 p.m. EDT Monday night (0356 Tuesday GMT) and had a busy day of spacecraft inspections ahead. The astronauts used the space shuttle's robotic arm to closely examine the heat shield panels along the shuttle's wing edges and nose cap for any signs of damage from falling debris during launch. Endeavour is flying a 16-day mission to the International Space Station to deliver and install a sophisticated cosmic ray detector, called the Alpha Magnetic Spectrometer, and a slew of supplies for the orbiting outpost. The shuttle is due to arrive at the station Wednesday (May 18) at around 6:15 a.m. EDT (1015 GMT). Heat shield surveys have been a standard part of every NASA shuttle flight since the tragic 2003 loss of the shuttle Columbia and its crew. NASA traced the disaster to a piece of foam insulation that fell from Columbia's fuel tank and struck the shuttle's heat shield along its left wing. Since then, NASA has kept a close watch on shuttle heat shield health during missions. Several inspections, by robotic arms and cameras, are performed on each flight. "Those were very small losses; they didn't look like they went anywhere near the orbiter," said Bill Gerstenmaier, associate administrator for space operations. "Those looked like they're no problem to us at all. The tank performance was probably better than I expected." "The ride to orbit went great, all the imagery we took today is looking really good too," Horlacher said. "I'm not aware of any concerns on the vehicle. We expect to hear initial feedback probably as soon as the crew goes to sleep tomorrow. Hopefully we'll get indication that a focused inspection won't be necessary." This picture, taken at an altitude of about 64,000 feet by a balloon launched as part of a student project, shows NASA's space shuttle Endeavour streaking toward space on its final STS-134 mission. Endeavour lit up the morning sky Monday (May 16) when it lifted off at 8:56 a.m. EDT from Launch Pad 39A at the Kennedy Space Center in Cape Canaveral, Fla.
"The vehicle looked very good going uphill," Gerstenmaier said. Endeavour's STS-134 flight is the second-to-last mission of NASA's 30-year space shuttle program and is the 25th spaceflight of Endeavour itself. The agency has one final mission – Atlantis' STS-135 flight in July – before the three-orbiter fleet is retired.